This image depicts the structure of the BAX protein (purple). 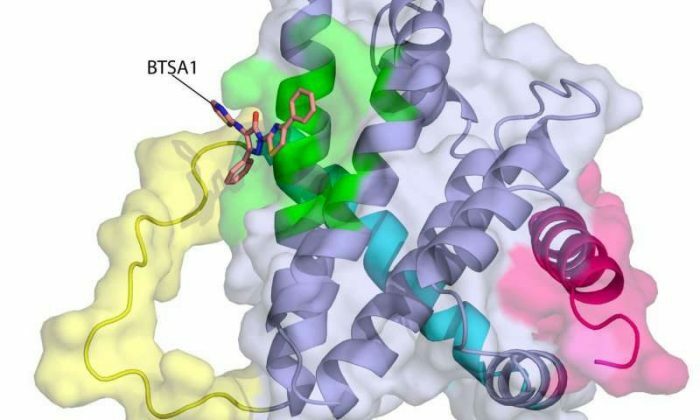 The activator compound BTSA1 (orange) has bound to the active site of BAX (green), changing the shape of the BAX molecule at several points (shown in yellow, magenta and cyan). BAX, once in its final activated form, can home in on mitochondria and puncture their outer membranes, triggering apoptosis (cell death). Scientists at Albert Einstein College of Medicine have discovered the first compound that directly makes cancer cells commit suicide while sparing healthy cells. The new treatment approach, described in today’s issue of Cancer Cell, was directed against acute myeloid leukemia (AML) cells but may also have potential for attacking other types of cancers. 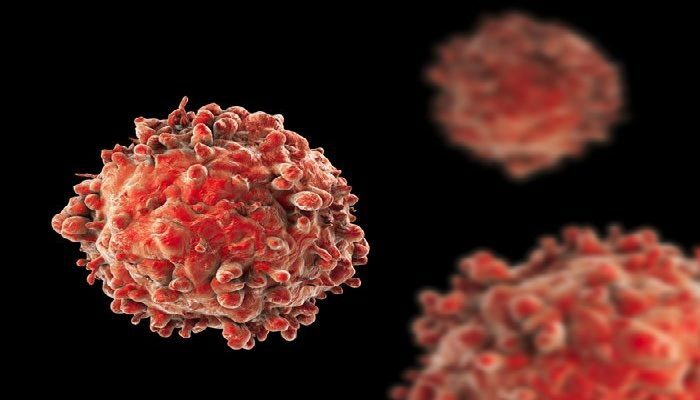 The newly discovered compound combats cancer by triggering apoptosis-an important process that rids the body of unwanted or malfunctioning cells. Apoptosis trims excess tissue during embryonic development, for example, and some chemotherapy drugs indirectly induce apoptosis by damaging DNA in cancer cells. Apoptosis occurs when BAX-the “executioner protein” in cells-is activated by “pro-apoptotic” proteins in the cell. Once activated, BAX molecules home in on and punch lethal holes in mitochondria, the parts of cells that produce energy. But all too often, cancer cells manage to prevent BAX from killing them. They ensure their survival by producing copious amounts of “anti-apoptotic” proteins that suppress BAX and the proteins that activate it. Dr. Gavathiotis was the lead author of a 2008 paper in Nature that first described the structure and shape of BAX’s activation site. He has since looked for small molecules that can activate BAX strongly enough to overcome cancer cells’ resistance to apoptosis. His team initially used computers to screen more than one million compounds to reveal those with BAX-binding potential. The most promising 500 compounds – many of them newly synthesized by Dr. Gavathiotis’ team-were then evaluated in the laboratory. “A compound dubbed BTSA1 (short for BAX Trigger Site Activator 1) proved to be the most potent BAX activator, causing rapid and extensive apoptosis when added to several different human AML cell lines,” says lead author Denis Reyna, M.S., a doctoral student in Dr. Gavathiotis’ lab. The researchers next tested BTSA1 in blood samples from patients with high-risk AML. Strikingly, BTSA1 induced apoptosis in the patients’ AML cells but did not affect patients’ healthy blood-forming stem cells. Plans call for Dr. Gavathiotis and his team to see whether BTSA1 will show similar effectiveness when tested on animal models of other types of cancer.